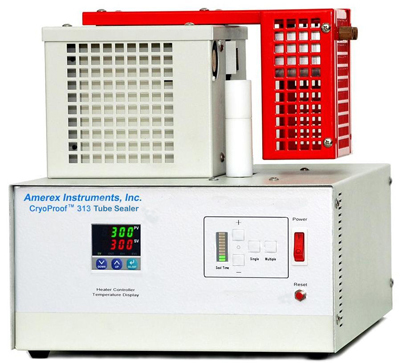 The CryoProof sealing process is microprocessor controlled, and involves simply placing the tube into a holder, putting a heat shrink tubing over the cap, and pressing a button. A beam of hot air shrink wraps the tubing around the cap as the rotating tube to form a seamless and uniform seal. The temperature of the hot air from the CryoProof is controlled precisely and the beam is focused only on the rotating cap. The result is a more consistent and reliable seal compared to manual sealing using a heat gun and crimping the hot ends of the plastic tubing. By sealing the cap and not the entire tube, you still can place the tubes in their regular racks for easy storage and identification after sealing.